Further processing the result of the BLEPP 2015 we took a look at the status of 2015 Repeaters. We took into consideration those schools with repeaters having a total of 6 and above examinees. There were several schools with a total of 5 repeater-examinees but they were not considered for this data. Our list above has a total 109 repeater-examinees from different schools with 6 and above examinees (the highest number is 20). A total of 50 repeaters (49%) from the list passed and 59 (58%) failed anew. It should be noted that a mere 20% of those who failed in 2014 were repeaters for 2015 just from our data above. But it can be assumed that the percentage of repeaters is generally much more lower given that those with 5 and lower number of examinees were not taken into account for this table. 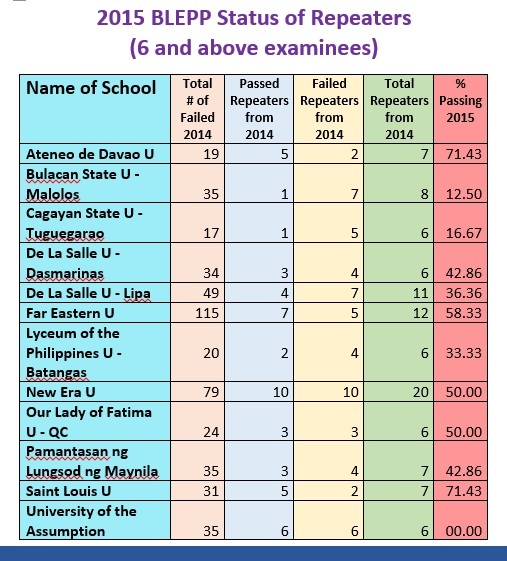 Ateneo de Davao University and Saint Louis University got 71.43% repeaters passing for 2015. Far Eastern University got 58.33% and both New Era University and Our Lady of Fatima - Quezon City both got 50% passing rate. With 20 examinees, New Era has the most number of repeaters who took the BLEPP 2015, followed by FEU with 12 examinees and De La Salle - Lipa with 11 examinees. 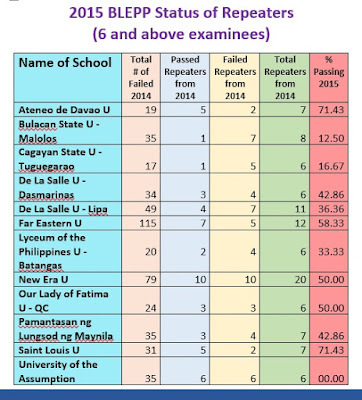 It is unfortunate for the University of the Assumption that nobody passed from among its 6 repeater-examinees.